Foodies, this is yet another guide for you guys. It touches our heart a little whenever we share our hometown with you all because it’s our root and we’re so proud of it. Again, Penang might be small but it still take days to completely tour around Penang. So, to make things simple for you guys, we have narrow it down to only focus on Georgetown, and here are the top 10 attractions in Georgetown. Truth to be told, Georgetown is the colourful, multicultural capital of the Malaysian island of Penang. Once an important Straits of Malacca trading hub, the city is known for its British colonial buildings, Chinese shophouses and mosques. Beyond the old town, Georgetown is a pretty city with many attractions point you have to visit when you’re in Penang. Without further ado, here are the 10 things you can do in George Town Penang. Malaysians who are visiting Penang or going back hometown to the Pearl of the Orient this Chinese New Year can expect to feast to a scrumptious reunion dinner in a grandeur when The Top Penang offers several dinning packages that come along with 360-degree grand fireworks display. Taking place for the very first time on the eve of lunar new year on 4 February 2019, the offerings for the dinner include shows and entertainments ranging from LED lion dance to the unique water drum performances, magic shows and live music. To spice up the event further, God of Prosperity, God of Longevity, Happiness and Fortune will make their rounds to distribute ‘heavenly fortunes’ in the form of mandarin oranges. These will be followed by a magical snowfall as a blessing to the auspicious celebration. To feast and enjoy these activities on the eve of Chinese New Year, the reunion dinner promotions are from RM118++ per pax at Top View Restaurant located at Level 59, RM148.80++ per pax (a minimum of 10 pax) at Imperial Court Restaurant, at Level 6 and RM198++ per pax at Coco Cabana Restaurant at Level 68. All dinners start from 6.30pm – 10pm respectively at individual outlets. For party-goers who only wish to countdown, they can party in style at 816 feet above-sea-level with a price of from RM68++ per person, 10pm – 1am. Apart from the reunion dinner, there are also other available promotions throughout the festivity between 5 – 19 February 2019. For more information about the offerings available at The Top Penang, visit thetop.com.my/promotion or follow Facebook.com/thetopofpenang or contact +604-2623800. Ever watched Jurassic Park and wondered what dinosaur looks like? Step into the Jurassic period where dinosaurs roam the Earth! Jurassic Research Center takes you through a truly education journey for both kids and adults where they can experience and interact with the life-sized dinosaurs. Address: THETOP@KOMTAR. 1, Jalan Penang, 10000 George Town, Penang, Malaysia. Previously 65-storey, Komtar now stands proudly at 68-storey tall, housing Penang’s newest icon – The Top. It’s the first all-in-one international visitor attractions hub which include include the Rainbows Skywalk, Tech Dome, Tongkat Ali Museum, 7D Discovery Motion Theater and a host of food and beverage outlets. Here, you can get a 360 view of Penang and also dine in one of the finest restaurants. We cannot emphasize enough of street arts in Penang, they’re located in every corner of the city, and each is equally unique. True, some might think that the hype is already over but hey, we’re not talking about fashion here. These are some of the primary things that made Penang what it is today and has inspired many souls. 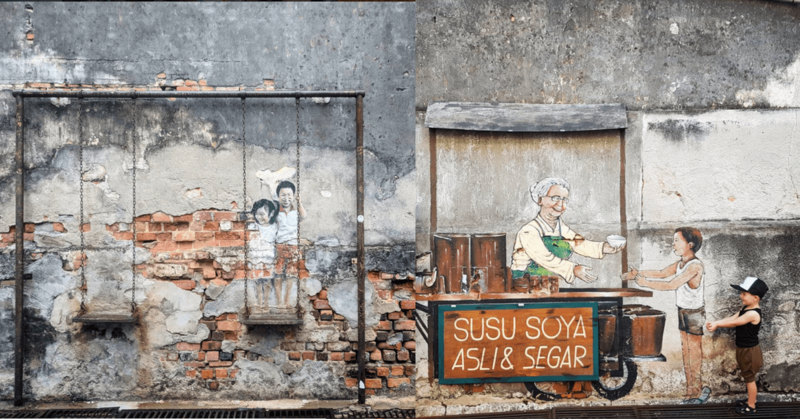 Some of the popular street arts could be found in Armenian Street, Chulia Street, Love Lane and some other close-by streets. They are the popular attractions in Georgetown. This might be the most family-friendly attractions in Georgetown. A musuem with decorated rooms designed for comical photos and optical illusions, you might just know what it is based on the name. Spend your afternoon here to have fun, unleash your creativity and inner child. Address: 10, Lebuh Penang, George Town, 10200 George Town, Pulau Pinang. Operating Hour: (Mon-Fri) 9 a.m.-6 p.m. Better known as the Waterfall Hill Temple or “Thaneer Malai”, this temple is no stranger to locals. It is the focal point of the Hindu festival of Thaipusam in Malaysia, after the Batu Caves. Visitors will need to climb 513 stairs to reach the temple, but the view and the structure will leave you astonished. If you happen to visit Penang in the late January, be sure to stay and visit this temple during Thaipusam, which is on the 31st. It is the most iconic and colorful Hindu festivals of all, which makes it into our top 10 attractions in Georgetown list. Address: 17, Jalan Kebun Bunga, Pulau Tikus, 10350 George Town, Pulau Pinang. Leong San Tong Khoo Kongsi, also known as Khoo Kongsi, is one of the most distinctive Chinese clan association in Malaysia. It is well known worldwide for its extensive lineage that can be traced back 650 years ago, as well as its defensive congregation of buildings and a magnificent clan house. Khoo Kongsi turns on its lights during every major festive and in conjunction with Chinese New Year this February, be mesmerized with the beautiful and detailed structure as they turn on their lights during Chinese New Year Culture and Heritage Celebration on 18/2 together with other performances. Address: 18, Cannon Square, George Town, 10450 George Town, Pulau Pinang. The largest standing fort in Malaysia, this was built by Captain Francis Light when he first took over Penang in 1786. Initially built as defense against piracy and other outside threats, now it has become one of the most historical tourist spot, as well as event and wedding photo shoot venue. Surrounded by greens, today, you could still see cannons standing strong at every corner of the wall. This is by far one of the best attractions in Georgetown. Address: Jalan Tun Syed Sheh Barakbah, George Town, 10200 George Town, Pulau Pinang. This is yet one of the many attractions in Georgetown that is no stranger to you all. Chew Jetty? Lee Jetty? They are all along the neighborhood can could be reached from one to another within walking distance. The Clan Jetties are unique Chinese settlements that have been around since the 19th century. Along the wooden pier are villages on stilts that house the descendants of Chinese immigrants. There are eight different clans that still resides here, each with similar yet different beliefs. Address: Pengkalan Weld, George Town, 10300 George Town, Pulau Pinang. Known as the Blue Mansion, one of the only three UNESCO heritage award-winning buildings, discover the lifestyle of Cheong Fatt Tze “The Last Mandarin and The First Capitalist of China”, his family, his favorite seventh wife and the era in which they represented the cream of Penang society. Tours are available here 3 times a day, with different languages offered, so be sure to check out their page for more information. Address: Ground Floor, 14, Leith Street, George Town, 10200 George Town, Pulau Pinang. Considered a new addition to the attractions in Georgetown, Colonial Penang Museum bring visitors back to Penang’s colonial past. Experience the lifestyle of both the British Administrators and the wealthy merchants of Penang and appreciate the intricate art form from the past. Here, you could find antiques and structures left behind by historians. This place also serves as an educational spot to have a better understanding of Penang’s rich culture and heritage. Address: 7, Jalan D.S. Ramanathan, Pulau Tikus, 10350 George Town, Pulau Pinang. Georgetown is an awesome place! These attractions are not just fun to visit, they fill your minds and hearts with history and culture that you’ve never experienced before. That’s why we’re always thankful and proud to be a Penangite. If you have not been to these place, take a day or two off to explore them. You’ll thank yourself for the decision you’ve made. Anyway, cheers Foodies and have a great day ahead!